Many thanks to Lindsey Anderson of Milwaukee Magazine for including us in this list! One of the highlights of my trip was Can Can Wonderland (755 Prior Ave. N). The exterior of Minnesota’s first arts-based public benefit corporation is unassuming, to say the least. 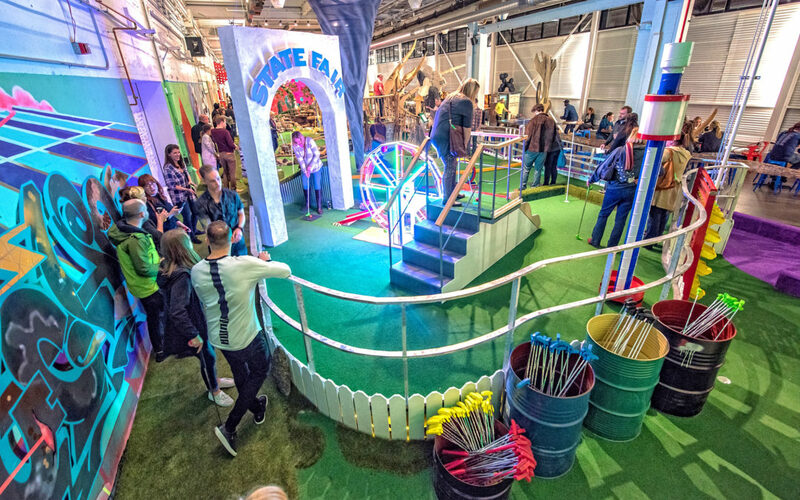 But the inside of the vast warehouse (the site of a former canning factory) you’ll find a colorful 18-hole mini golf course designed by local artists, an extensive collection of pinball machines and other arcade games, a stage where live musicians and other entertainers perform most nights of the week and a large bar and restaurant area. You could easily spend an entire evening there, sipping delectable cocktails while perfecting your putting.